Valentine’s Day is a very special time of the year for everyone. Sometimes, planning for the holiday and decorating your home can be a bit last minute. The kitchen and dining area are some very important rooms to start off the night. By decorating these areas in a specific way, you’ll create a very romantic setting. Here are some easy last-minute decorating tips to set the perfect romantic mood in your dining space. Decorate your dining table with nice dishware and wine or champagne glasses to make the occasion special. For the table’s centerpiece we recommend roses in a glass vase, because let’s face it: roses are the definition of romance. Once you have the visual décor in place, play some romantic background music. 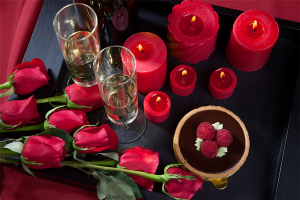 Around the room, we suggest placing candles to add a romantic fragrance and a dim glow. Also, consider updating your light fixtures with dimmer controls so you can dim the lights for a more romantic tone in your dining space. Adding dimmer controls to your home will create a permanent romantic feel so that you can set the mood throughout the year. Stop in to Horton’s to find all of your light dimming needs or shop other light fixtures that can help set the tone of this special occasion.